The next Student Blogging Challenge starts in March September, 2010 and this time we’ve decided there are tasks that need to be done BEFORE your class actually takes part in the challenge. So we’ve designed a series of nine steps, with how-to info, to help you with your class blogging. Our first step is to create a class blog. A class blog is always a good starting point if you want to blog with your students. It gives you to time to increase your skills while gradually introducing your students to blogging and educating them on appropriate online behaviour. Start initially with you being responsible for writing posts, and the students responding in comments. As students demonstrate both keenness and responsibility give them their ‘blogging license’ where they earn the right to write posts on the class blog and/or get their own student blog. Ultimately even if each student has their own blog it is always a good idea to have a class blog. Blogging isn’t just about writing posts; it’s about sharing your learning and reflecting on what you have learnt. The class blog is the central hub that connects your student blogs together; making it easier to share their learning, interact with each other and a global audience. Your username is what you use to sign into your blog dashboard and is displayed on posts and comments you write. While you can’t change your username, most blog platforms do allow you to change how your name is displayed. In most cases it’s better to choose a username that makes it easier for others to relate to you as a real person. For example, compare spwat3 with suewaters — which is easier to relate to? On a class blog you need to consider what is an appropriate username for you to use. Most don’t allow students to use first and last name online so some prefer to model this by using names like Miss W or Mrs Waters. Think carefully about your blog URL. Once your blog has an established audience you’re less likely to want to change your blog URL and educators often use the same blog for the next year’s class. Ideally you want to keep your blog URL short, easy to remember and suitable to be reused for several years. Alternatively use something unique that has meaning like Jan Smith (http://huzzah.edublogs.org). Think about the name of your blog. Choose a name that reflects the purpose of your class blog and your students can relate to. For example, Mrs Burton‘s blog title Blog, blog blog blog, blog some more is very clever. Check out our class blog list for titles that other educators have used! Coming up with ideas on how you might use your blog with students can be hard to visualize. Make time to check out how other educators use their class blogs to get ideas on “what works”/”doesn’t work”. Now you’ve done all the research it’s time to set up your class blog. You will find all Getting Started With Edublogs information here! If you have any problems or questions while setting up your class blog just leave a comment on this post — I’m always happy to help! You can make a blog private using the privacy options at the bottom of Settings > Reading. We recommend you use the password privacy option as it is easier for parents (and students) to remember a simple password rather than a username and password. Is there a possibility to see and nice blog on your mobile. We use a tablet PC and the website has some problems with uploading – too slow or do not open them. Otherwise, we are very pleased with theedublogger – Thank you. Thanks for this tutorial about creating a class blog. This is very useful for me. thanks.Thank you! I have never won anything. This is great, I’m so excited. I can’t wait to get the book. Inspiration is always needed. Thanks for the tutorial in creating a class blog. It is nice looking for this one. I will try to create one, too. Thanks for sharing this one,. Where can I have the next steps? Hi Theresa, to change it on each student blog you need to log into their dashboard and go to Users > All Users. If you are an admin user on their blogs you should have a link to their dashboard in Dashboard > My Blogs inside your account. Help! I recently got an Edublog Pro account and set up a blog for my class. 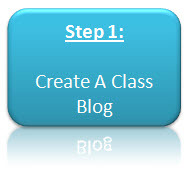 I would like for each of my students to have their own blog that is linked the the main class blog. At this point I have entered all my students usernames, email addresses and passwords. The list of their names shows up in the blogroll on the main page. However, when I click on a student’s name, instead of going to their page, I am sent to the Edublog page for setting up a new account. What am I missing? Why don’t my students have pages? Hi Theresa, it looks like you have added them as a user to your blog rather than create a blog for them? What you need to do is go to Users > Blog & User Creator in your Pro blog dashboard and click on Create Blogs tab then follow the instructions on this page – http://help.edublogs.org/2009/08/31/creating-student-blogs-using-the-blog-user-creator/ For students who already have an existing username you just add their email address (and don’t include their username or password). Once you’ve done that you then set up the blog roll using the blog URLs you have created. Thanks, that worked! I have a second question about user roles. I would like to change to role of students who have parent permission slips so that they are Administrators on their own blogs. I want them to be Subscribers on the class blog. When I go the class blog dashboard and click on Users, there is only one role I can change. Is that the role for the class blog? Where do I change their role on their own blog? When I set up pages, shouldn’t they be static, with no opportunity to comment or leave a post? I would like to have information links (like the about the class, blog guidelines…) that do not have the “blog” feel at the bottom, just the information, nothing to comment. Not sure what I am doing wrong. Tomorrow I will try to set up my students… thanks for any help! I had no problem using the “Blog and user creator” — now how do I turn them off, or stop them. School year is over and do not want to allow kids to continue to update, etc. Is it possible to “reset” them so I can reuse them next school year? Hi Leslee, you have checked our recent post on Getting blogs ready for the end of school year? Hi, I am also interested in whether there is an automatic update a blog, or want to put my school class blog? I have just started using edublog. My teacher has made a class blog which I`m having difficulty keeping check on. Is there a way to get automatic updates of posts from him or a notification? Hi Justin, totally understand and initially it can be hard working out the best way to keep up with the class blog. First used wordpress, then switched to Joomla. Pingback: Why Blog? | read.write.connect. My mother asked me what I wanted to do with my life at dinner today. She basically wanted to know what I wanted to be because I had been putting that decision off for quite some time, however, I had my mind made up when my mother asked me the question. @Dr. Mowen Glad you like my image and sure I would love it if you used it in your book. Please don’t hesitate to let me know if you need anything else for it from me. And best of luck with your book! 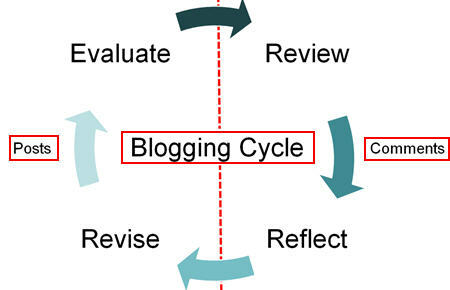 Sue Waters: I would like to use your graphic showing revising, reviewing, reflecting, and evaluating as a process of blogging in a book chapter regarding technology and higher education. May I, please? I would like to set up a class blog for my tenth graders. I have 125 students. What kind of account should I get? Thanks for clearing up the issue with widgets, Sue. Can you please address my other query regarding sub link categories? I know you can have a sub category, but I want to have a heading for some of my links. I have ‘Learn English’ as a link category, and under that, 2 links. I would like to have a sub category called ‘Conversation videos’ and put links (about 10) under that, rather than list them all under ‘Learn English’. @Betty Gilgoff thanks for the nice feedback. I try hard to provide the information in a format that covers the most important points. @Jasmine You need to be using an Edublogs Pro blog or have your blog upgraded by an Edublogs Pro blog to be able to embed. This is why you aren’t able to embed. So what we have done is an Edublogs Pro is automatically able to embed all code including Voicethreads, Teachertube and is able to upgrade up to 50 blogs other blogs so that the 50 other blogs can also embed code, access premium themes and their ads are disabled.